DIY or hire a pro? | So what? Now what? I’ve recently had the “pleasure” of going through a website audit and migration to a new host. The next step is a transition to https. I am using the very capable services of MaAnna at BlogAid, and I quite literally could not do it without her. I started my blog because I wanted to write and connect—not because I knew anything about the technology or web programming. In fact, I hired someone to build the site for me. When it was ready, he handed over the keys (in this case, the URL, username, and password) with a video explaining how to publish posts. End of lesson. I’ve muddled through by not trying anything fancy, only adding a plugin here and there when one of my readers asked for something I didn’t have—“Where are your share buttons?” or “How do I subscribe to follow your blog?” Then I would google it or ask fellow bloggers for advice. That worked (more or less) until I started hearing noise about the need to move from http to https. At first I resisted. After all, I don’t sell anything on my site or gather sensitive information from my readers. But everything I read or heard kept pointing to the inevitable need to make the transition. The fact that the “how-to” articles sounded like Greek to me was a clear indication that I should not proceed on my own. I asked for references from respected bloggers, and they led me to BlogAid. The experience got me to thinking, though. When it comes to tasks outside of your core strengths and passions, is it better to do it yourself and learn by trial and error—but at least learn—or to hire a professional and spend your energy on the things you know and love—but in the process, remain forever ignorant and, therefore, dependent on outside help? For me, the answer lies somewhere in the middle. I made a mistake by having someone else build my blog without showing me anything along the way. I had no way to be certain the services I was enrolled in or the technology used was right for me. When it came time to evolve my site, I didn’t know where to start. If I’m completely honest, I didn’t even understand the basic language of most layperson bloggers. On the other hand, I would never have started a blog at all if I had to build it on my own. Technology is not my strong point or my passion. I’m also pretty certain had I ever made the commitment to start from scratch, I would not have done any better (and maybe far worse) creating my own blog than the person I hired did. So now with the migration to a new host and the transition to https, I am taking a different approach. I am paying an expert to perform the audit and make fixes, but we communicate frequently, and she takes the time to explain to me what she is doing and why. We’ve had several live web sessions, and I have enrolled to receive BlogAid’s weekly tips, which I intend to read and learn from. My focus will continue to be on the writing, but I want to at least have a functional understanding of the technology. When it comes to the big stuff, I will continue to rely on the pros. What about you? Is your blog a DIY project or do you use the services of professionals to keep it running? This post is shared on the GRAND Social. I am going to respond by saying that the outline you note in your last paragraph is what I use. I am in the process of renovating my kitchen. We, my husband and I, did the deconstruction to save some money. However, since I wanted a kitchen that was a place where I could really feel comfortable in, we hired professionals. However, we have been there for the journey as they worked. We watched them install every step of the way. We were there for discussions and decision making so we know how the kitchen is put together. What we do not have is the skill set to do the details that set the kitchen off. These people have done hundreds of kitchens. They know what they are doing. I suspect that is true of every renovation including blogs. Looking forward to seeing the renovated blog! I think what you describe really is the best way. Sometimes in the past, I’ve tried to turn things over entirely to the pro, and it usually doesn’t work out the way I wanted it to. It’s best to stay involved–for the learning factor and to ensure the job is done the way you anticipated. Thanks for your input. Have a wonderful day! That said, hubby and I did decide to put in our own patio pavers last fall. Being retired, we had the time. It was a completely flat space. Hubby is actually very handy (he does all of the home repair stuff that I don’t call in professionals for). So we went for it. And it turned out pretty good and I got a true sense of accomplishment. Makes me wonder what else I can tackle… like more about my blog support. Hmmm. I think I’ve relied too much on the pros in the past, at least in terms of not paying attention. I still want the pros to do the work, but I need to be more aware of what that work involves. I’m impressed that you put in your own patio pavers. Impressive! I think it’s smart to hire a professional when the expertise required is way outside our comfort zone. On the other hand, I have muddled my way through a problem (often a problem I’m having with technology) and have felt quite pleased with myself when I successfully figure things out. And you are so right about remaining in the dark if you blindly rely on someone else to fix things… it’s always good to understand at least a little bit about a subject. I created my blog on my own using the very easy WordPress system. When I decided to change themes some very generous fellow bloggers helped me with a few sticky points by holding my hand. I have never had the desire to switch to https and am curious as to why you wanted too. I’ve heard enough stories about the downsides and not enough about the upsides (for those of us who don’t want to monetize our blogs) to make it attractive. Thanks for weighing in on DIY vs. pro, Janis. Primarily, I decided to make the switch to https because I was afraid of scaring off new readers with the red “Not secure” warning I started to see in the browser bar. And even though all I collect is names and email addresses, I want to make sure those are secure. I’d hate to be the reason someone got hacked. After hearing about other bloggers’ challenges making the transition, I knew it was not a project that I would take on myself. Have you heard of downsides to https besides difficulty of the actual transition itself? HI, Janis – WordPress.com (free site) users automatically had ‘https’ long before self-hosted (paid users had it)….and we had to pay extra for it. That’s another thing that made me wish that I would have started with the free version of WordPress. Live and learn! Janis, my understanding is that Google is going to start penalizing sites that are not https. I assume the penalty is that you will be harder for non-subscribers to find, but I don’t know for sure. The reason for https is that it’s as secure as our ‘insecure’ Internet can be. I don’t enjoy the technology side and my blog is first and foremost about the writing. I’ve used WordPress because it was an easy way to start and didn’t cost anything as I tested the waters. Good on you for learning but I’m not sure I’m prepared to pay a professional at this point. Children are usually handy for tricky bits! I hear you, Chris. There are definitely advantages to letting WordPress carry the load. Thanks for stopping by and commenting. 1) As I mentioned to Janis above, the free WP version had free https way before the paid version. 3)Free WP automatically sends commenters an email that someone has replied to their individual comment. This has been a very difficult feature to get working on my paid site. 4) As Janis stated, the free version is well-maintained and smooth running. When she encounters difficulty, free WP support is always there. For me, when I encounter difficulty, WP often refers me to Blue Host or to Jetpack (or vice versa) or often suggest yet another upgrade. Ugggh. All this being said, I have learned HEAPS, am proud of my accomplishments and am very grateful both to other bloggers and our local WP meetup for their generous help along the way. Good luck with your site migration. I can’t wait to read more! Thanks for the detailed response. I also assumed the self-hosted paid version would be the best. I’m not sure now, but I am invested in the choice I made. I am inspired by your story to look around and see if there is a local WordPress group in my area. Thanks for the info. You have a beautiful site, Sue, so kudos to you! I’m curious, did you start your blog after retirement or while you were still employed outside the home? I would like to be able to spend more time learning the technology and working on my blog, but can’t seem to find the time with my job, my blog, my fitness goals, and my family commitments. I guess it’s a matter of prioritizing–just like everything else. 🙂 Thanks so much for hosting the #MLSTL party. I truly do look forward to it each week. There is such a great variety of bloggers there. Yes, Dee, MaAnna has been great helping me improve my site and secure it. Thanks to you and Marilyn for the recommendation! Also, thank you for all the tips and advice you’ve offered me along the way. You’ve been a great resource, as well as a friend. I know the feeling Jennifer. I’ve kept my site pretty basic, because it serves my purpose, and because I don’t have the time or the inclination to get fancy with the technology. Thanks for taking the time to comment and for sharing. Christie, you sound so much like me with this blog business. Daughter sat up our blog when we first started but now that she isn’t as involved and is busy with work I have no idea what I need to do or where to start if I did. I don’t know what you even mean when you say you are going from http to https. Is that something I need to do also? When you talk about doing things yourself or getting professional help I think about the two and a half men when Alan climbed on the roof to fix the t.v. and fell and broke everything. Everyone kept asking him why he didn’t call the man. lol I guess I might need to call someone. I’m someone who is mostly DIY, but I completely agree when it came to the https change-over there was too much involved. I did try to figure it out, but I ended up paying someone to complete it. I just didn’t want to screw it up at all! 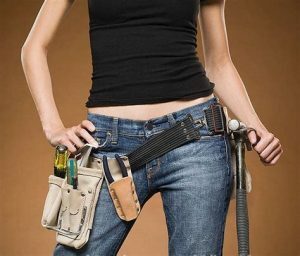 I saw the tool belt on those hips and thought of all the trial and error when I renovated a big old house 10 years ago. I hired pros for the massive or critical but jumped into the rest of it myself (although my brother probably got more phone calls than he wanted!). When I first came on line, I had a tech build out my site, but I have one of those personalities that wants to know how everything works so I started learning. Today I build out all my sites by myself (although I use a site builder, only code the odd thing). I also have a great hosting company and their support is AH-mazing!! I think we never appreciate how much we’ve learned until we’re asked for advice… and give it confidently! I admire your willingness to jump in and learn by trial and error, and you are so smart to pay attention and learn from those professionals you do hire. Just curious–who is your hosting company? There is something to be said for that feeling when you learn/accomplish something new! With the help of a pro, I made it successfully through migrating to a new host and transitioning to https. I’ve done everything myself for my blog. I’ve spent a lot of time learning what to do, and of course making mistakes along the way. It’s worth it to me though…I want total control over my blog and enjoy the process. Beautiful website, by the way. Hello Loretta and welcome! I’m so impressed with someone who figures out the technology herself (or himself). There is something to be said for having the knowledge and the control. Thanks for the compliment on my website. I’m on my way now to visit yours.